This single source encyclopedic volume contains the answers to numerous complex shielding problems. 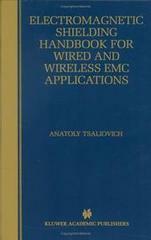 It integrates basic concepts with hands-on techniques and practical recommendations on a broad range of EMC and shielding-related subjects: the role and significance of the shielding discipline, electromagnetic energy coupling and transfer mechanisms, shielding cables, enclosures, systems, sound shielding design, evaluation, measurement practices and other timely shielding topics. The handbook suggests original methods of cost-effective and optimal design selections and solutions to shielding systems and their elements. It spans all shielding levels: single chip, printed circuit board, cables and cable assemblies, whole products and systems - up to complex networks. This new handbook is based on more than 30 years of the author's experience in the electromagnetic shielding and EMC field. It significantly expands upon Cable Shield for Electromagnetic Compatibility - a previous book by the same author. A number of important new `non-cable' topics are included, and a more general introduction to the subject is given, in addition to providing a wealth of detailed and useful material. It will be a resource for answers to numerous difficult shielding-related questions, as well as especially valuable to the EMI and EMC community at large. Professional engineers, researchers and students interested in electromagnetic interference, compatibility and its biological safety will find this handbook invaluable. 1. Introduction to System EMI and EMC. 3. Transfer Parameters of Electromagnetic Shields and Enclosures. 4. EMI Environment and Electromagnetic Coupling in Shielding. 5. Shielding Effectiveness for EMI Protection. 6. Shielding Measurement Techniques and Apparatus: The Tools of the Trade. 8. This Brave New Old World of Electromagnetic Shielding. 9. Appendix: Selected Topics in Electromagnetics and Circuit Theory.